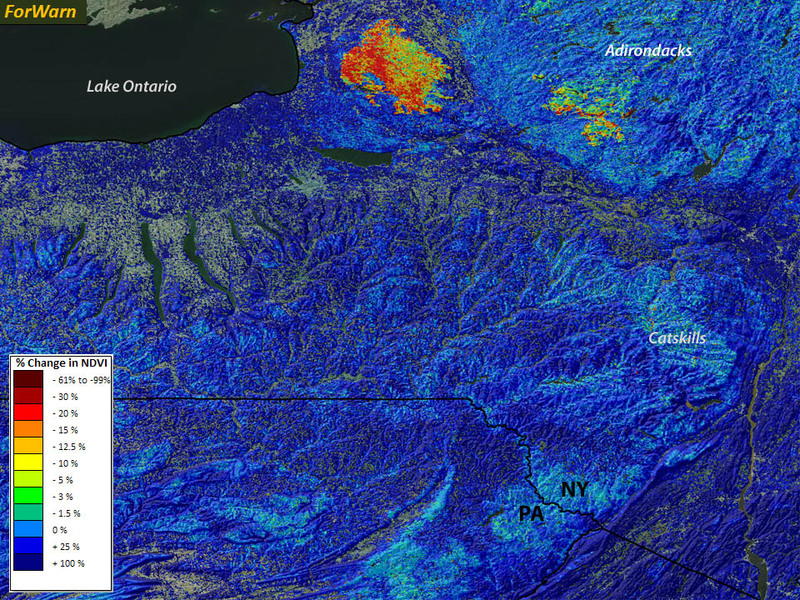 This late April 2010 image shows a large anomaly just east of Lake Ontario on the Tug Hill Plateau of New York. A less severe area of departure from the prior year’s condition occurs to the east. Based on weather records, the 2009-10 winter at Lake Pleasant, just east of Tug Hill, was 4.5 degrees F warmer than it was during the prior winter. Continued warmth into spring explains why so much of the northeast is strongly blue in this image. Somewhat ironically, warmer winter temperatures caused more snowfall east of open water in places like the Tug Hill Plateau. Warm lake water increases evaporation which leads to more intense snow storms. While satellite views suggest that Tug Hill’s snowpack had melted during March, this persisting anomaly likely relates to the heavy lake effect snow accumulation from the prior winter’s unusual warmth. It contrasts sharply with the surrounding landscape that experienced an anomalously early spring that year, so it is unusual compared to both the prior year at Tug Hill and 2010's regional condition. Note that the strength of the anomaly is greater on the western half of the plateau--closer to Lake Ontario--even though elevations are higher in the east.